I have been working on a project for a while (2-3 weeks) and it’s finally ready for public consumption (finally). So I’m in this improv group that I am sure I’ve mentioned before. Anyway, we wanted to incorporate music and sound into our shows, but not everyone knows how to play an instrument and we didn’t want people solely devoted to music. I pontificated on the matter for a while and decided to try to make a sampler-type thing. I wanted to program it myself because any program I could find wouldn’t let me customize it exactly as we needed it. I ended up using a program/language called Pd. 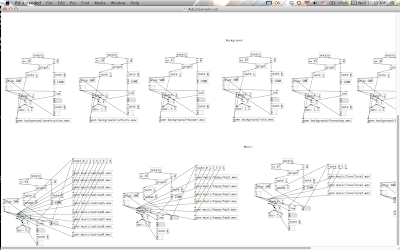 It’s a graphical language that is geared specifically for audio. I also had a MIDI controller kicking around so I used that for input. This is what it looks like all labeled and stuff. 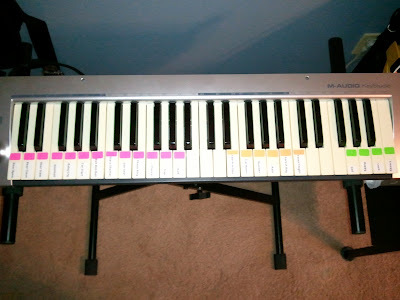 Pink keys are sound effects. Hit the key and it plays and left the key and it stops it immediately. Orange keys are background sounds. Hit the key and it plays that sound and when you lift it will fade out. It will also loop the effect if it hits the end of the file. Green keys are emotional music. 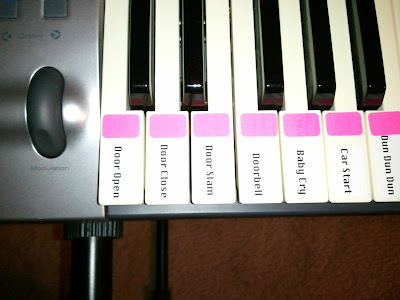 If you hit the key it will play a randomly selected song in that emotion. Let go it will fade out. It will also loop the track if it hits the end. The whole thing was a bear to figure out because I had to learn Pd first and the logic is much different from traditional programming languages which is what I knew. I also ran into problems with sample rates which caused the songs to play at double speed. The fix for that was converting every file to the same type of wave with the same sample rates. Anyway here is a video of it in action and it should be in use this Friday at our show which will be online at our website sometime next week. Previous PostPrevious On Settling and Why I Can’t Do It.